MainelyTangles: Weekly Challenge #136: "Colour Colour Everywhere"
I made my move from Maine to Boston this past week and I feel a little discombobulated. My arty things are still in boxes and I need a bit of time to get re-established in my condo digs. So, already feeling a bit out of it, along comes a color challenge! Yay! All of I could think of after a week of contemplation was "color blocks." Easy, fun. 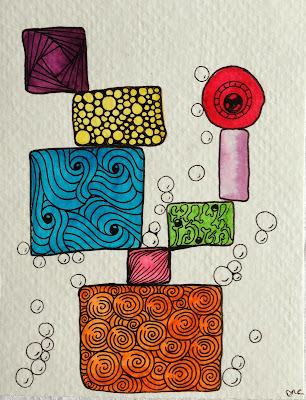 I like these blocks and the bubbles around them. Hope you get setteled soon.